Human vision begins when light enters the eye and is focused by the lens onto the photosensitive tissue at the back of the eye, the retina. 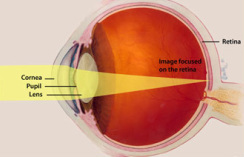 Light-sensitive cells in the retina - the rod and cone photoreceptors - capture incoming photons. Through a complex biochemical pathway, the energy of a photon is amplified into a change in the electrical properties of the photoreceptor cell membrane. Changes in neurotransmitter release at the photoreceptor synapse propagate nerve impulses through a series of neurons in the retina. There are five major classes of neurons in the retina: photoreceptor cells, bipolar cells, amacrine cells, and ganglion cells. Eventually, the light signal is transmitted through these retinal neurons to the optic nerve and to the brain.